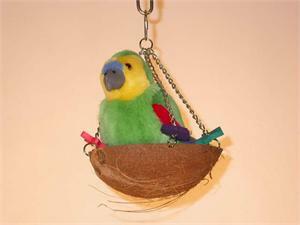 Your little buddy will enjoy playing in this coconut shell. Or use it as a hiding place for his secret treasures. It hangs from the cage top by chain supports that have colored wooden shapes added for his chewing pleasure. Lovebirds adore the Happy Hideaway! Stuffed toy bird not included. Height w/ Q-link or chain: 8"
Height w/o Q-link or chain: 2"